"No, NO, NO!! That is not what I want! Stop it!!" That's me, this past weekend, rushing to click "thumbs down" again, and increasingly frustrated with each bad choice suggested to me by Pandora.com. My situation: long-time enthusiast and Pandora user, multi-year payer of the annual $36 premium for ad-free Pandora One. Trying to create a new station called "Jazz Bistro with Piano," that would recreate the feeling of a small acoustic jazz club, good music for twilight on into a peaceful evening. The reality: bumping over and over into Pandora's music choice algorithm, which can't understand what I want, and has no means by which I can tell it. After a while I had clicked "thumbs down" so many times I ran into the daily limit on skipped songs, so my custom radio station just stared at me blankly when I tried to give it feedback, one of those dreaded "computer says no" situations. The state of personalization for ideas that involve personal taste, like music and movies has a long way to go. Right now, we could call it the era of "a little bit of you." Let's go into the Pandora experience and see this in action. Example one: my "Indigo Girls" station is acoustic singer-songwriters, with a bit of preference for female artists. Besides the namesake duo, it's a natural place for artists like Carole King, James Taylor, and Laura Nyro. Also for Mary Chapin Carpenter, or so I thought; Pandora groups her with country artists, making her an outlier in my station, but still well within my taste. Alas, the result is an open door to all sorts of country music I don't want on this station, and no way to instruct the system that Ms. Carpenter appeals for other reasons. I like country music sometimes, but this station isn't where I want to hear it. Back to the "Jazz Bistro" effort: as you may know, you "seed" a Pandora station with artists or songs, and the system tries to figure out what you like. In theory, a "thumbs up or thumbs down" toggle allows you to teach the station to reflect your preferences more closely. But it works very poorly. Case in point for this station: I seeded it with the name of French pop jazz composer Claude Bolling. In the 70s, his "Suite for Flute and Jazz Piano" was the heart and soul of many a brunch, many a fern bar. It was on the best seller charts for 10 years. Bolling would be a great addition to my new station. What does Pandora pick up on? French. Flute. Classical (because Bolling was sold under a classical label.) I spent the next 5 songs in a row clicking "NO" on classical french flute pieces, and finally went back in frustration to delete poor Mr. Bolling altogether. It wasn't his fault, he was a victim of "a little bit of you," in which Pandora uses a sledgehammer where a pair of tweezers would have been a better tool. Last year, Fast Company did a feature on Pandora's efforts to add social features, and to refine personalization. They quoted Chief Technology Officer Tom Conrad, who believes that "personalization is the foundation for the total product and user experience." Here's the thing: it's just not that personalized yet. Pandora is very proud of its Music Genome Project, which seeks to identify metadata on millions of pieces of music, feeding the ability of the algorithm to find music you like. It's now added features to add input from others like you through the social tools. But the core of "music you like," your own feedback, is still remarkably coarse and of limited use. The general feeling Pandora's selection process offers is, "you're not really qualified to do something this advanced, but we are." 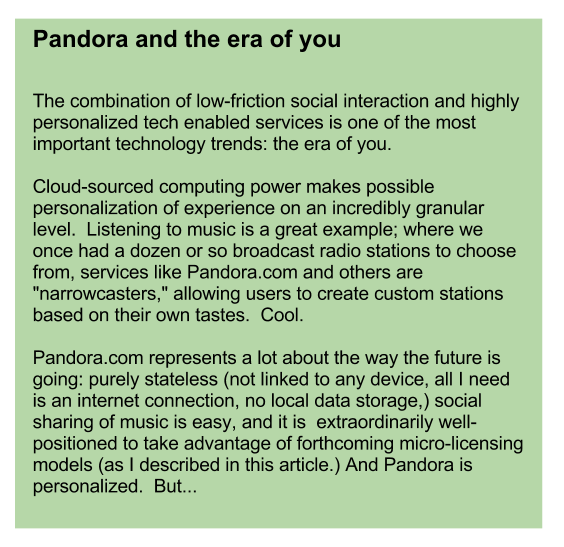 Pandora is a case where personalization has a good start, but with two steps, it can fully enter the era of you and give each user a richer experience. Not to mention, it can give Pandora a competitive edge against a raft of competitors in the music recommendation field. Some specific artists of my choice: like the Claude Bolling example above, or Bobby Short, who is to me the ultimate jazz bistro artist. --Use the Music Genome Project resources, but temper it with user input: When I went back to the Jazz Bistro station I've been trying to create, the first selection was by Nat King Cole. That's good, in general, his music is perfect. So I clicked, "why was this track selected" and got this: "Based on what you've told us so far, we're playing this track because it features swing elements, smooth vocals, romantic lyrics, an electric guitar solo and a piano solo." Right, as far as it goes, but I don't want electric guitar, especially a solo. Each time this dialog comes up, Pandora should let me thumbs down the characteristics that don't fit and thumbs up the ones that matter. It should also be heuristic to learn the common metadata elements that drive my choices for this station. 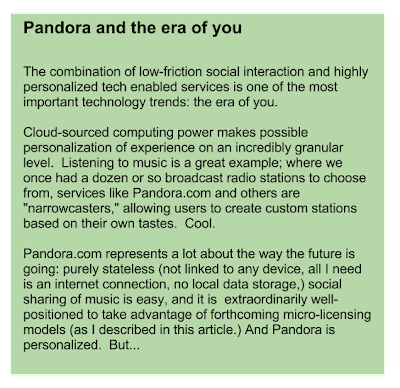 Extreme personalization can go the other way as well, into Pandora's own infrastructure and licensing models. Last year I discussed this in an article on new models of content ownership based on our emerging stateless future. The gist of it is this: if I pay once, anywhere, for a license for personal use of a song, video, book, or software, it is my right to consume it anywhere, at any time, on the device of my choosing. If I've ever bought James Taylor's "Fire and Rain," a Pandora micro-personalization subroutine should be able to poll my library of purchased works, and not pay a performance royalty to stream it to me. If giving me the best possible personal radio station is the external expression of the era of you, this model is its internal, enterprise expression. 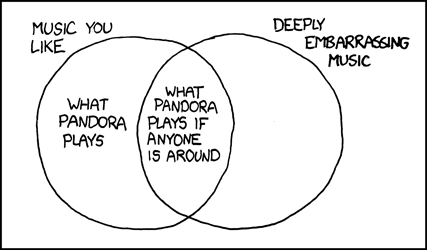 I'm still trying to get my new station right, and ever-hopeful for the success of Pandora.com. They are so close to being great, and I'd much rather have the imperfect version of today than be tied to old-fashioned terrestrial radio. They just need to understand that personalization works best when you remember to involve the person at the deepest levels. Making some tests (not hacking or something near it, just creating stations with specific seeds and checking results) I discovered how pandora works, well a little. 2-Start to play songs similar to this one. 2.1- 4 songs in a row. 3-After those 4 (or less) songs are played it will choose a new seed song and do the same again with this song. 5.1-And if I remember the song will used as the seed for the next 4 songs, after the 4 (or less) songs playing in a row, end. Christimas music (has christimas lyrics) is biased towards other christimas music and get mostly (or only) christimas music as recommendation. Artists have even separated christimas music profiles. The same about kids music. The same with movie music. Classical music have some genome characteristics that will only be used there, if some song has classical music influences (like martial industrial) they will not use it. So thumbing down a song don't make some sort of anti-recommendation that influence your recommendations, it just make this song not be played anymore on the station, and (maybe, in the case of 2 thumb downs), stop to play the 4 songs in row and choose a new song as a seed. The same about thumb up, adding normal metal and then classical music as a seed dont make some sort of mix of their genome characteristis, and make the station play some sort of metal/classical music songs, it just play metal and then classical, then metal, then classical. Thanks, that is all useful information. BTW, if you thumb down the same artist twice, I believe it then excludes that artist from your station; this was helpful to me when Paul McCartney music started showing up! It all reinforces my original point; true personalization is not the use of an all-powerful predictive algorithm, but in the use of predictions *combined* with user input. Pandora.com works really, really hard on the former, not so much on the latter. By behaving that way, they really miss the boat on what they state is one of their main reasons for being. Yes, forgot to add this info about thumb downs, adding thumb down to songs from the same artist twice remove him from the station, UNLESS he has a song as a seed on the station or he is as a seed on the station. The thing about pandora is that pandora made some pretty awful decisions. I mean, who cares if the song that start to play has christimas lyrics? Why not allow christmas recommendations to non christimas seed? They could make a user option where they would disable christimas lyrics songs, if they hate it. Instead of making those separated profiles that gives only christimas lyrics songs and not giving christimas lyrics songs to not cristimas lyrics seeds. The same about kids music, they could make some sort of parental option that parents would pick and the station would play only recommendations that fit in this kids music rule. Play the 4 consecutive songs from some of the stations in the mix (or less if you thumb down songs) and then just jumps to the another station. All thumb downs and ups effect only the station playing and not all stations. About using artists as a seed. I dont know if pandora do some sort of genome mixing/average of all their songs characteristics and make recommendation based on this genome mix or it just pick a song from the artist at random and use it to give the recommendations. In the case of using random songs from artist as a seed instead of this genome mix (something that problably happens), I dont know if it still use as a seed songs from the artist the songs you thumbed down in this same station. Also a important thing, pandora is biased to same artist used as a seed (dont know if because their songs are similar of not) and will play the songs from the artist used as a seed alot. I dont rememeber if this bias will happen when you use a song as a seed. Also in the song and artist profile of mainstream artists, i am not sure but I think pandora has a bias towards other mainstream artists, I mean sometimes I see some recommendations that I am sure that there are underground stuff that would suit more. This doenst happens (or happens WAY less) on albums recommendations on their profiles.